As a forward observer ancient enough to have covered the Vietnam War from the field and from Washington, I see President Obama the pragmatist winning out over Presi­dent Obama the egotist in taking his next steps in Afghanistan. This was not the case with President Lyndon Johnson, even when most of the American people had decided Vietnam was a war with­out end. So Johnson kept sending his generals what they asked for until he had more than half a million service men and women on the ground in Vietnam and in nearby launching pads like air fields in Thailand. Johnson’s presidency went down the drain because he could not bear the thought of letting Ho Chi Minh and his successors beat him, even though tape recordings in the public domain have him confiding to his close friend, the late Sen. Richard Russell (D-Ga.) that the Vietnam War was unwinnable. A broken-hearted Johnson decided not to run for re-election in 1968. His longtime Republican rival, Richard Nixon, succeeded him. Nixon eventually handed the war over to the South Vietnam­ese under Vietnamization and negotiated a peace treaty with the North Vietnamese. The North Vietnamese broke the peace treaty, conquered the South in 1975, and unified the country into today’s Vietnam — a big U.S. trade partner. Could Obama suffer a similar fate in Afghanistan? In contrast to Johnson, what I’ve seen Obama do so far suggests he is more pragmatist than egotist, though he has plenty of ego. Yes, he will make a stand in Afghanistan so it doesn’t look like he is cutting and running from the war he has adopted as his own. But I don’t think he will give his generals everything they ask for, as Johnson did. What I’m hearing from people who claim to know Obama’s thinking is that this president will lean toward Gen. Stanley Mc­Chrystal, field commander in Afghanistan, but not fall over for him. This new “surge” in troops and weapons will have lots of Obama’s strings attached. I’m not reading from a top secret McChrystal document like my former Washington Post colleague Bob Woodward did when he posted the general’s status report recently. But Obama clearly does not want to be a one-termer. He knows full well most Americans and many of their hired hands in Congress are sick of the eight-year Afghanistan war. They worry we’re wading into another quagmire. Moving front and center in the public mind is the question of why are we spend­ing so much blood and money to support a corrupt government in Kabul. Obama, to address these and other concerns, will almost cer­tainly send fewer than the 40,000 additional U.S. troops Mc­Chrystal is said to want on top of the 68,000 scheduled to be in Afghanistan by year’s end. Obama is likely to show light at the end of the tunnel by announcing a timetable for reducing U.S. troop presence. In response to the corrupt Afghan election, Obama is likely to demand Afghanistan’s central government achieve bench­marks to keep U.S. troops and money coming. As for an exit strat­egy, Obama will accelerate training and cleansing of the Afghan army and police so he can back out via Afghanization, following in Nixon’s footsteps. He also is likely to approve more arms-length strikes against the Taliban and al-Qaida in Pakistan whenever our armed drones detect them. Although McChrystal talks about U.S. troops camping out month after month with the Afghans to protect those building schools, digging wells, tilling fields and giving medical treatments, I think Vietnam pacification efforts wave a big red flag. Our NATO allies have little stomach for protecting dangerous ar­eas and the U.S. Army and Marines are too small and weary to do it all. The Afghan army and policy are widely feared by the Afghan people they are supposed to protect. And yet no country, especially fiercely independent and tribal Afghanistan, likes to have foreign troops in their face. And where would all those U.S. troops needed for pacification duty come from? The dirty little secret of why American citizens have given presi­dents Bush and Obama so much time to show progress in Iraq and Afghanistan is that few in the establishment have sons and daugh­ters in those half-wars. With the end of the draft, the all-volunteer force has turned out to be an overworked and underappreciated version of the French Foreign Legion. The burden of protecting our democracy is not being shared equally in our society. The burden is being carried mostly by the have-nots. 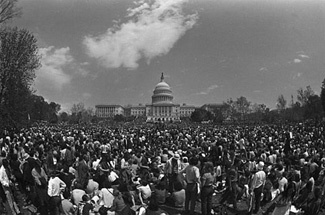 Because of the draft, Johnson had to contend with hundreds of thousands of anti-war protesters. One published account, which sounds credible, has the beleaguered Johnson asking his assembled generals what they propose to do when pro­testers fill up the ellipse behind the White House to come for the president. The clock is ticking slower for Obama than it did for Johnson because of no draft. But the ticking for Obama is getting louder. This column first appeared in National Journal’s CongressDaily.com. One can agree with much of what Wilson says, but once again his emotional attachment to US warmaking trips him up. "The burden of protecting our democracy is not being shared equally in our society. The burden is being carried mostly by the have-nots." If only he could have - accurately - written: 'The burden of fighting our AGGRESSIVE WARS and OCCUPYING other countries is being carried mostly by the have-nots.' "protecting our democracy" - what complete nonsense!